The lips you want. The lines you don’t. Finally, a filler that can help you achieve your ideal smile. Restylane® Silk is the first FDA-approved product specifically designed for lip enhancement and the smoothing of wrinkles around the mouth in patients 21 years of age and older. Everyone’s facial structure is different — and so is everyone's ideal lip shape and size. Silk is designed to provide precise lip shaping and line control, resulting in silkier, smoother lips and natural-looking results. 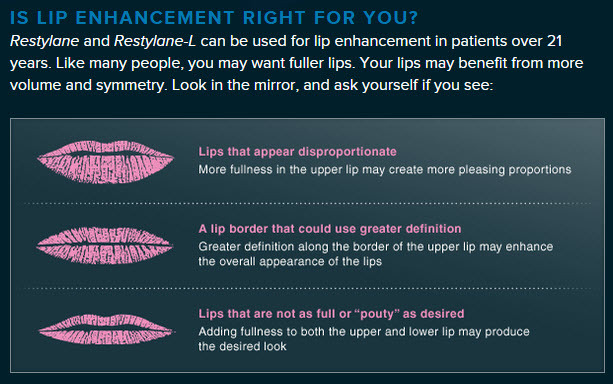 Find your ideal lip shape and talk with a specialist about how Restylane Silk can help you achieve the look you want. Restylane® Silk is designed specifically to provide natural-looking results. 59% of patients treated with Restylane® Silk maintained lip fullness six months after treatment. Restylane® Silk is a crystal clear injectable gel composed of hyaluronic acid, a natural substance that already exists in the body. The FDA-approved filler is injected into the skin to enhance lip fullness and to improve the wrinkles around the lips. Once in your skin, the hyaluronic acid gel creates volume, resulting in a more healthy and vital appearance. Hyaluronic acid occurs naturally in the body and therefore it also dissolves naturally with time and is integrated into your body's tissues. The effects of wrinkle fillers such as Restylane® Silk can last months. What is Restylane® Silk used for? This hyaluronic acid filler can be used to improve the appearance of thin lips and wrinkles around the mouth. The gel temporarily adds volume to the lips and plumps skin to minimize the appearance of fine lines and wrinkles. The treatment is performed by injecting Restylane® Silk under your skin. Since no pre-test is needed, your procedure can usually be done in less than an hour. What results can I expect from Restylane® Silk? You results will depend on your overall goal and suitability. Depending on the area treated, most folds and wrinkles require one treatment. The repeat maintenance treatment is not usually required for approximately six months or longer. The great thing about Restylane® Silk treatment is that you can replenish your natural beauty whenever you feel the need. Restylane® Silk is a patient-friendly procedure. One thing to remember is that this filler is like an ice cube in your body. It dissolves slowly, much like an ice cube dissolves in water. So it doesn't go from there to not there in one moment, but over months and months. You may have hyaluronic acid fillers injected during the same office visit along with BOTOX® or Dysport™. If you are taking antibiotics, there should be no problem continuing them if you have this procedure. But talk with the doctor about all medications you are taking. Restylane® Silk is indicated for submucosal implantation for lip augmentation and dermal implantation for correction of perioral rhytids in patients over the age of 21. Restylane® Silk with Lidocaine is a sterile gel of hyaluronic acid with 0.3% Lidocaine.